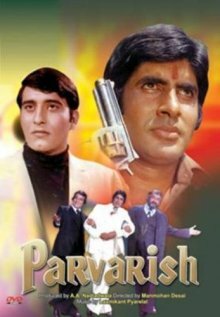 Given that it's from Amitabh's golden period, Parvarish isn't a hugely popular film (hell, it's probably Manmohan Desai's fourth most popular film of 1977, a year in which he hit the jackpot with Amar Akbar Anthony, Dharam-Veer and Chacha Bhatija). But it's a rollicking entertainer: extremely fast-paced, with good action scenes for its time (notwithstanding the repeated close-ups of a toy submarine in a bathtub), fine performances by two very charismatic leading men – and, naturally, dollops of unintended humour (though nothing to equal the Gay Dosti of Dharam-Veer). The only serious flaws are the mediocre music and Shammi Kapoor's heavily gelled beard, though Shabana and Neetu's bell-bottomed dancing compensates at least for the former. The plot is complicated: it begins with the rotund but fearless Inspector Shamsher (Shammi Kapoor) arresting Mangal Singh (Amjad Khan), a bandit. Mangal's wife dies in childbirth but not before calling Shamsher "mere bhaiya" (it works every time) and asking him to ensure that her baby boy has a good upbringing, away from his father's shadow. Shamsher takes the baby to his palatial home where his wife (we never learn her name, it doesn't matter) is waiting, and they decide to raise the child themselves, as a brother to their own infant son. Anyway, to cut a long story short, a bitter Kishan (Vinod Khanna) grows up under the mistaken belief that he is the adopted son, which is why he’s being treated like a pariah. Though still living in the Inspector's house and working as a teacher at a blind school during the day, he throws in his lot with Mangal Singh and aids him in nefarious underground activities. Meanwhile the steadfast Amit (Amitabh Bachchan) becomes a policeman, unaware that his own brother is part of the smuggling operation he has been trying to crack. Even within the limitations of mainstream Hindi cinema, this sort of character has been treated with a measure of complexity in other films – the obvious example being Amitabh's brooding role in Shakti, as a policeman's son who feels unwanted and deliberately moves as far as possible from his father's moral compass. But Parvarish being a Desai film, there's no pretence of exploring the nuances of Kishan's character. In fact, the whole thing quickly turns into a friendly in-joke: given the easygoing relationship the grown-up Kishan has with his parents, there is little motivation for his wrongdoings at all (except the most important motivation of all: allowing Vinod Khanna to come up against Amitabh's upright policeman so there can be some friction between the two heroes). But Parvarish is a joyous work that deserves to be seen for many other reasons, including the spiky walls and the quicksand in the villains' den, and the sight of Kishan cowering behind a plush sofa while the trigger-happy Inspector fires about the house in fatherly wrath. Best of all: a young and callow Tom Alter as a henchman named Jackson who strips off and puts on a scuba mask when he has to dive and check for bombs on the outside of the submarine. P.S. In another Manmohan Desai film released in 1977, Amar Akbar Anthony, Bachchan and Khanna reversed roles: AB played the loveable rogue, while VK donned the police uniform. That's probably Desai's version of expanding his repertoire. If this were a film made by a Serious Director, how much fun we'd have psycho-analysing the function of the blind students! Please don't let this stop you! Analyse away - that's the function of Popular Culture Studies. Imagine the fun you could have with deciding once and for all who is really blind - the children, or VK, in a moral, ethical and social way. Can't remember the film; is this the one where these two women are dancing in a half-constructed building? Oh I never let it stop me! I think everything deserves analysis - aren't we agreed that a work is what we make of it, not what it was intended to be? is this the one where these two women are dancing in a half-constructed building? Yes, but every Manmohan Desai film has a scene like that. "garish living room" - priceless. I guess I watched this movie one Friday night when I had nothing else to do and I was wondering whether this had a scene where the leading ladies are performing a qawwali with the idea being that they are going to shoot someone off at the end of the song and it all goes horribly wrong ?? Remember watching it first day, matinee show, way back in the 70s. Sold some newspapers (raddi) to pay for the 75 paise ticket and piddled into an earthen tea cup shared with a couple of pals (one of whom now heads the electrical engg dept of a great univ while the other has been global CIO of the year). I think it had the awesome pass phrase used by smugglers, I mean it beats the pants off of any security protocol.